Hello DTT forums. I'm a new poster here. 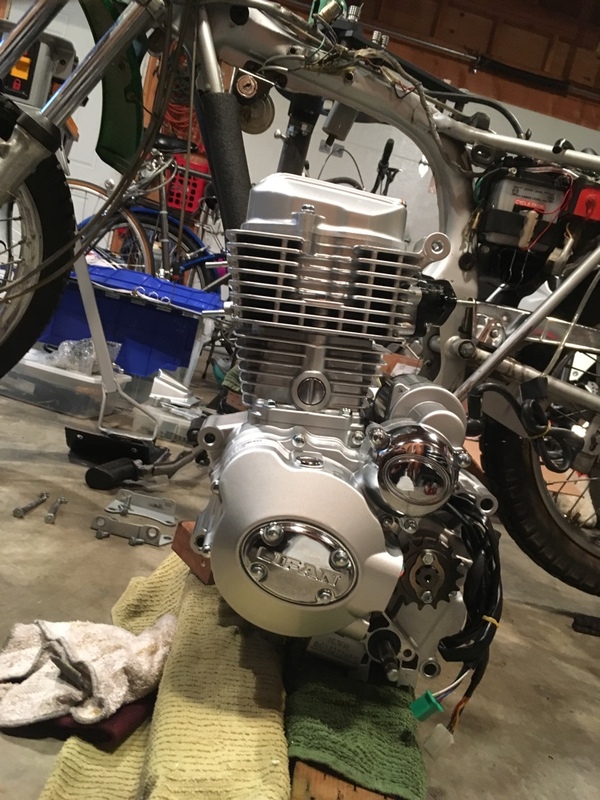 I started this thread to chronicle my installation of a Lifan 200cc 163FML motor into my 1972 SL100. I intend to use the finished bike to bushwack around the unimproved roadways and alleys (of wich there are many) here in my home of Southeast Portland, Oregon. 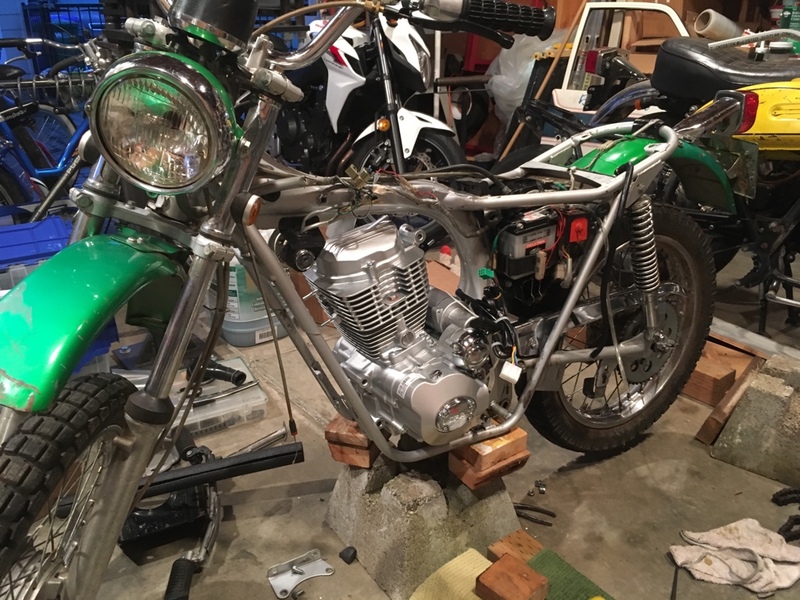 Below is the bike before I started the Lifan engine install. A couple years previous, I purchased the bike from a couple in White Salmon, Washington for $500 running with clean title. Its not in awesome shape, but it is solid overall. Major drawbacks were a Kreem-coated tank and some dents and other bruises from a few thousand miles of trail-time. I test road the bike at purchase, but neglected to shift above third at the time. Back at home, I did some sprucing up, then took it for a ride around the neighborhood. As soon as I shifted above third gear, it would not for its life come back down without me stopping the bike and hammering the shifter. With misplaced hope, I pulled the side covers and troubleshot the problem away from the shift linkage (which I had prayed it would be) to inside the engine cases. 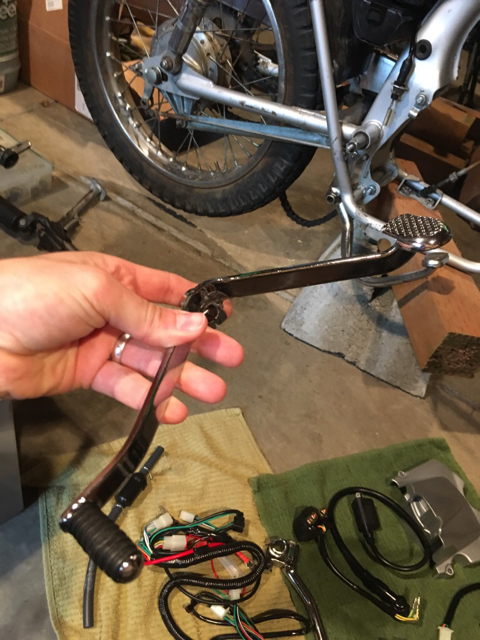 Naively, I pulled the engine apart and found the problem to be in the shift drum and forks. Never was able to pinpoint the cause, but the project ended up back-burnered and languishing due to my idle disinterest in engine work. A year or so back, I found online that one may swap in a 200CC Lifan 163FML engine with relative ease. 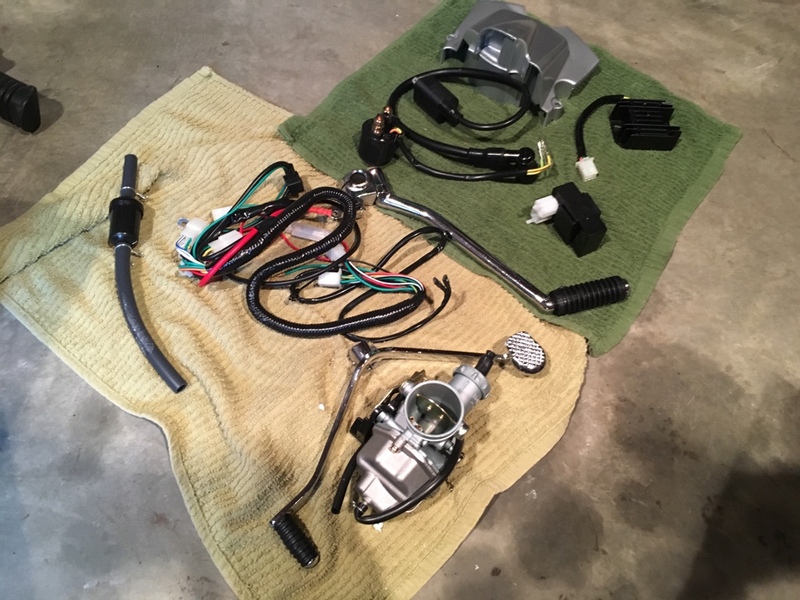 Added horses, electric start, 12v system, and a fresh motor for $550 was tempting. A couple weeks ago, I decided to pull the trigger. I ordered the crate motor from PCC Motor via eBay and received it a few days ago. The following will be my attempt to log the whole installation, break-in process, and then my review. When I've finished, I may publish an Instructable or similar on this topic as there seems to be a relatively scant quanitity of info about these motors (though I may be corrected by DTT members here). 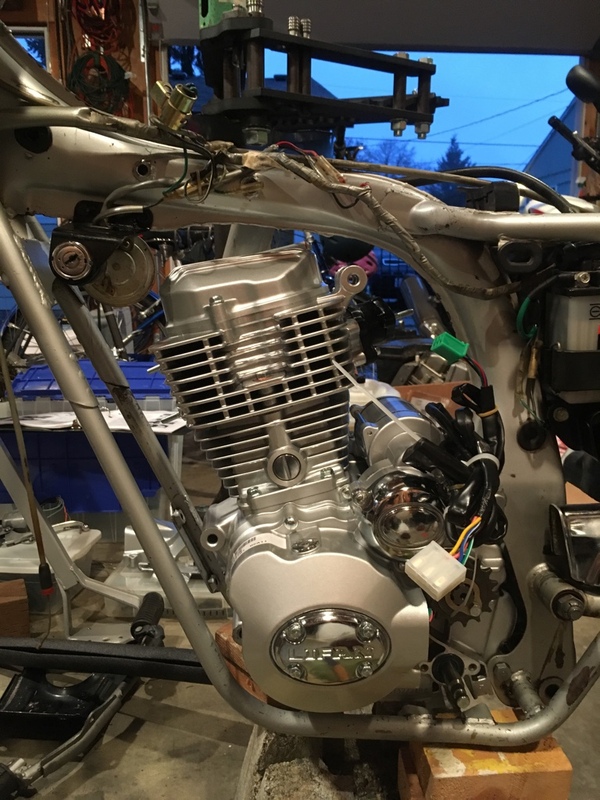 By way of introduction to the DTT forums, I'm a 31-year-old, business jet mechanic from Portland, Oregon with an awesome, motorcycle-friendly wife, two daughters and a mutt. Thanks! 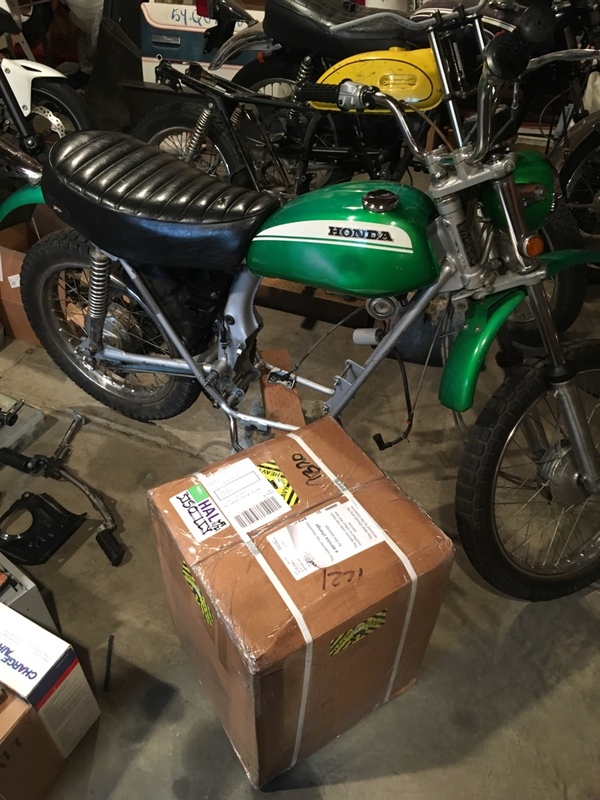 I ordered the "SET" version of this Lifan crate motor, which meant I received a carb, CDI ignition box, coil, kickstart lever, shift lever, regulator/rectifier, starter solenoid and wiring harness for the motor as well. Here's the extras unboxed. On opening the box, one is greeted by the distinct aroma of Harbor Freight Tools (also known as Chinese/Thai industry). I think this is produced by a combination of the fresh rubber, and the preservative oils they lather on everything, for wich I am glad, considering these machines plow through the salt-spray of the Pacific to get here. But! Keep in mind when unbagging the engine that it will be slicker than snot. I wiped the whole thing off before attempting to mount it in the frame. The motor after unbagging shown below. Once de-oiled, my wife and I wrestled the lump into the SL's frame with ease. Well, as easy as ever, anyway. The new motor's jug is sizably larger than the 100cc original, so it was a tight squeeze. I was able to bolt it in with the rear mounting holes and the front mounting plates, no problem. 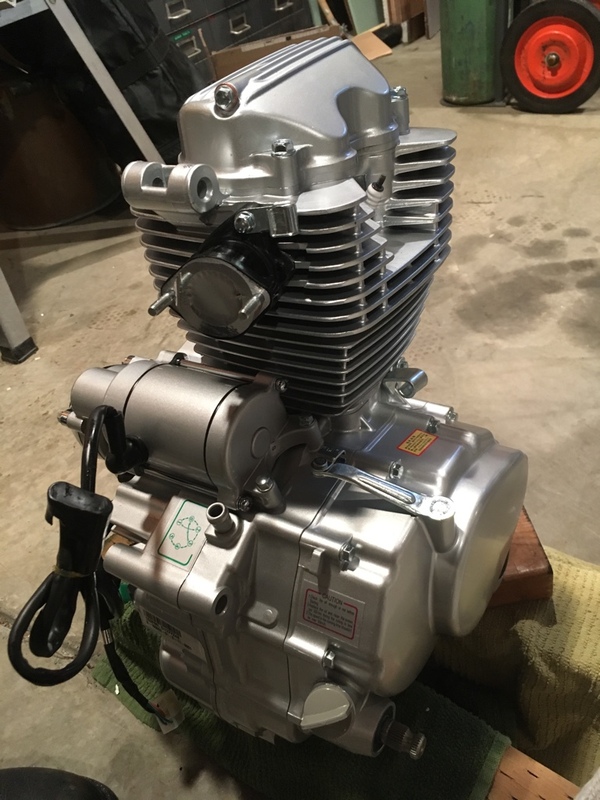 However, due to the Lifan motor being a push-rod OHV affair (unlike the OHC original Honda motor), the top mount point on the head is nowhere near the original. I've seen others simply ignore this, which is probably fine. Personally, I'll be fabbing up some new brackets for the head which will include some of the new electrics as well. This is the very old school shift lever included in the set. Good to hear you've had success with this motor. I am, indeed, looking forward to riding it. I've got some 1/8" mild steel plate I'll be making new upper mount brackets from. Interesting about the rear mount bolt size. I'll be looking into that. Frankly, the front bolts seemed similar, but the stock bracket's holes are oversized quite a bit. Wide manufacturing tolerances, I'm guessing. Didn't know the holes in the Lifan engine case were actually larger than original. Been a while since I had the original engine out of storage. 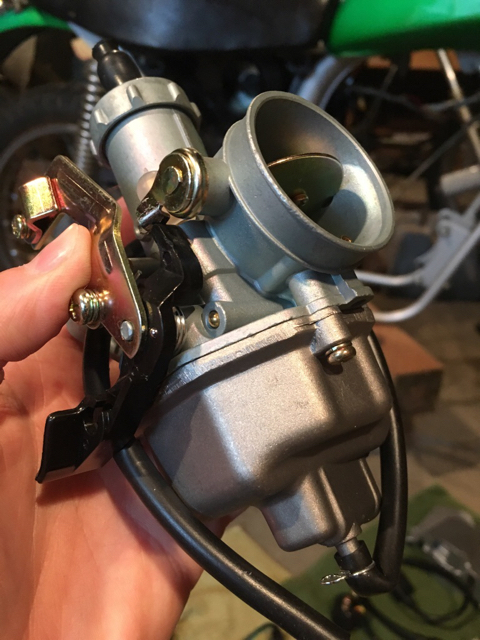 As for the carb, I'll run with the cheapy for now and see what happens. 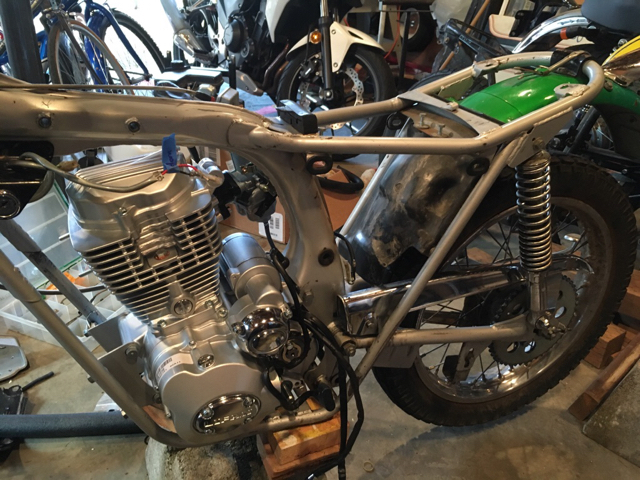 I intend to use the stock exhaust header, if possible, and put a more size appropriate slip-on muffler in place. Can't use the original airbox boot (different size), so I'll run a pod filter. For all interested, it should be noted I received absolutely no information with this motor. No parts breakdown, break-in guide (aside from a sticker on the side cover), no mount point dimensional drawing, nada. Just the packing slip from PCC Motor. 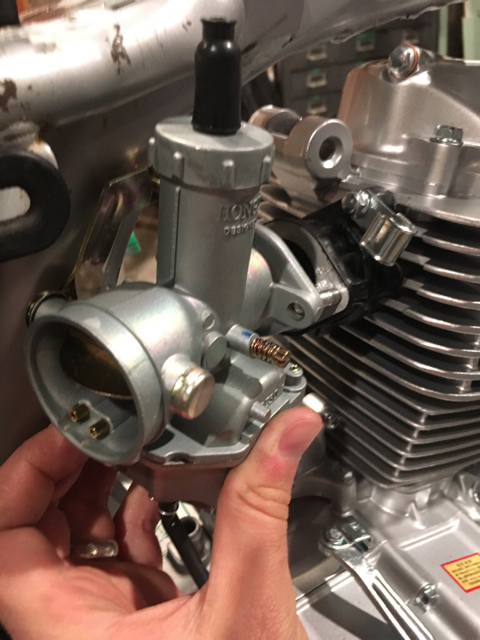 Below are some pics of the supplied carb. 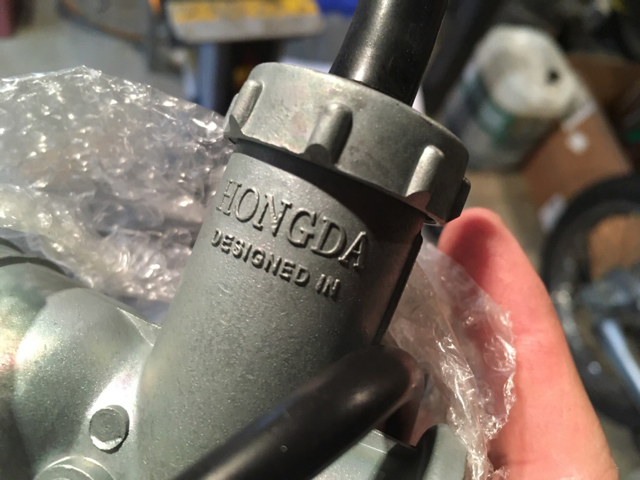 "HONGDA" huh? 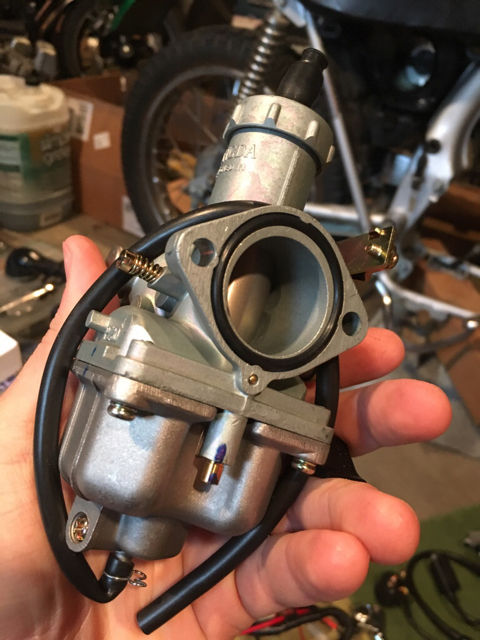 A mark of high quality somewhere, I suppose... You can find these carbs online for $15-$20 new, so I'm not expecting much. Sounds like an interesting swap, pics are broken though. Pics should work now, I think. 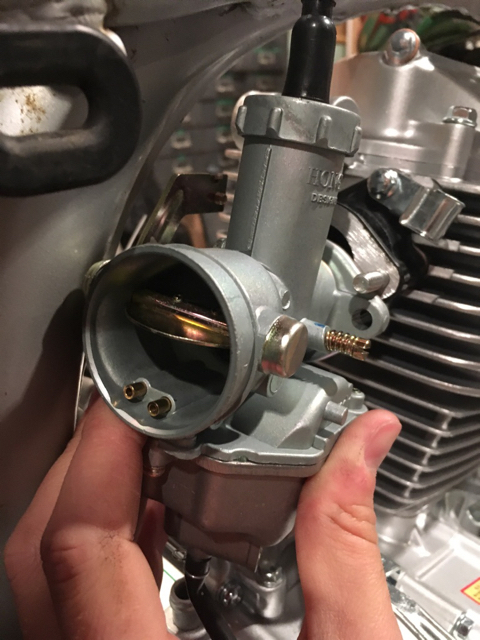 The included carb won't install in place unless you loosen the screws securing the boot to the head. Not much room between the choke mechanism and the frame. 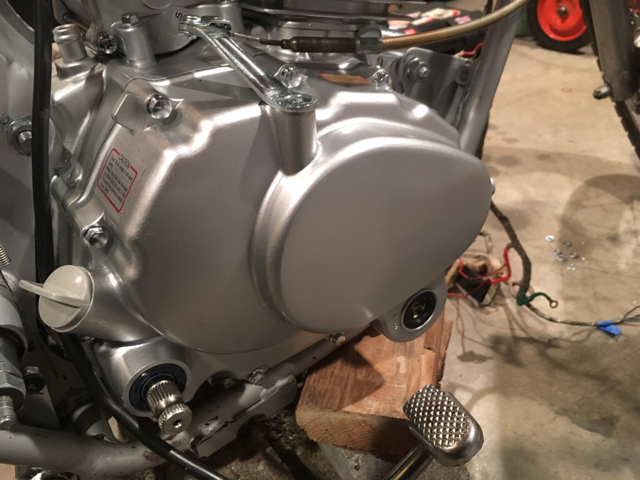 The original battery holder and air box assembly is removed. 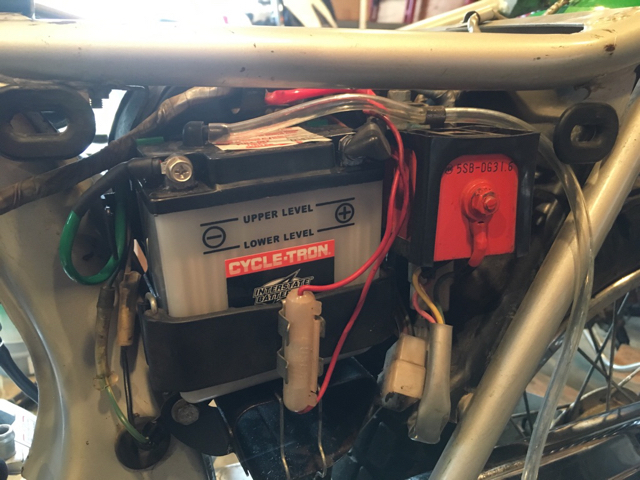 I'm doing a full 6v to 12v conversion, so I'll be fabbing a custom battery and electrics holder. 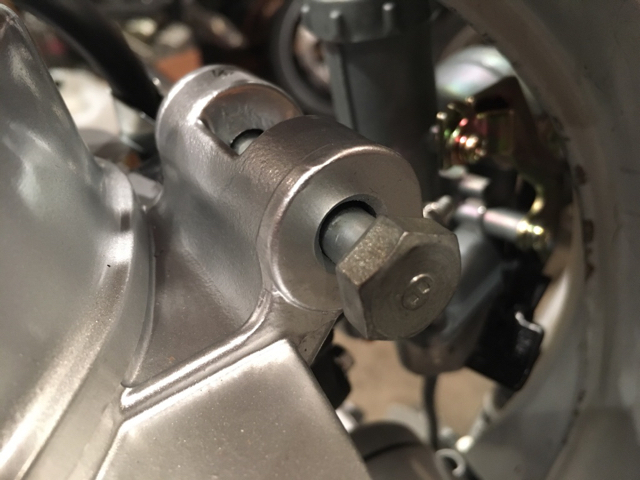 Next, I'm going to carefully correct the bolt size problem cxman pointed out, then start working toward a first start on the engine. I looked into the bolt size issue and here's what I found. The mounting holes in my Lifan measure not quite 9mm inner diameter. This is consistent with a loose fit for an 8mm bolt, which is the Honda original size. Curious, I grabbed the box with the cases from the Honda motor and found them to be basically the same, if not slightly larger. As such, I'm sticking with the original hardware. I couldn't even get a 10mm bolt through the Lifan's mounting holes. 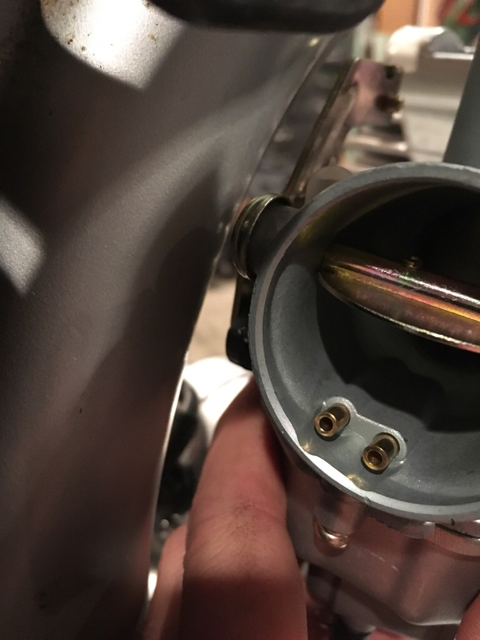 Here's a pic of the original top bolt going through the Lifan top mount hole, just to see the fit. This, from my experience is a pretty typical fit for bikes of this age. I wonder, cxman, if our Lifans are just a bit different here. I've already been surprised at the number of little differences there seem to be among these engines. Case in point, mine has no "LIFAN" on the right hand side cover.